HITZ Baseball and Fastpitch is expanding and we are looking for coaches and teams at all levels and age groups for the upcoming season. State of the art training center set up for the best team and individual training. Roving instructors to assist and provide individual training also. Teams will be posting dates and times soon, as some teams are still playing out current season. -Teams will host tryouts Middle of July-August with all teams formed by no later than end of August. -Teams will train October-April with League and tournaments starting in April. 15U-Sikora call or email for workout HITZ donnysikora@gmail.com Team is a combination of experienced MABF players from multiple teams. We are looking to play in the MABF Upper A 15U division and a mix of AA/Major tournaments (4 projected) for the 2019 season. Team is looking for 2 – 3 skilled, versatile players who can pitch as well. Team is having private tryouts at HITZ by appointment only. Please contact Donny Sikora at (586) 634-1401 or donnysikora@gmail.com to schedule a time. I want to extend my thanks to all coaches, player and parents in our organization. You are among the best youth baseball and softball have to offer. Your contributions to our growth as an organization is invaluable. I love walking around the facility and seeing players at all age levels, excited to enter our facility and work/train to get better. It gives me chills and goose bumps as I just love watching all these players train and get better at the sport they love. Our mission is to provide opportunities and exposure while competing at the highest levels in youth baseball and instilling discipline, teamwork, sportsmanship, honesty and integrity. HITZ teaches their players to respect the game, work hard, and to play hard. 1. Provide each player with the opportunity to learn, develop, and improve their skills on a regular basis. The HITZ Baseball and Softball Club focuses on consistent hard work and striving to become a better ballplayer. We believe in pushing your teammates to be better, picking them up when they are down, and always believing in yourself. Character is revealed in times of adversity and baseball provides that adversity. By putting these young baseball players in extremely competitive situations, we help them develop their character which will benefit them not only in baseball, but in life. All of our coaches are expected to work together and uphold the high standards of the program and embrace them. This includes maintaining a winning tradition both on and off the playing field! These high standards apply to several areas including practices, conditioning, social life, and typically extend beyond the playing field when it comes to academics and giving back to the community. Our coaches are expected to make sure their teams practices with a purpose. Preparation is important. Previous coaching experience with proven track record of success both on and off the field. Comfortable working with high level athletes. Ability to work well with others and embrace the HITZ culture. Have an understanding that coaching is "managing". You must have the ability to manage people. **Some teams have Extensive travel required during fall & summer. Whenever a player goes out onto the field, he cannot always control whether he gets a hit, makes an error, or gives up a home run. A big part of baseball is failure! There are, however, many things each player can control, which play a big part in his ability to be successful and play at a high level! When a player is on the field, it is very easy to see if it is his passion and if he truly loves the game. It is also just as easy to see if he doesn’t have that passion and is ready for the game to be over with! How is it so easy to spot the guys with passion? 1. The guys that play with passion are sprinting EVERYWHERE they go on the field. They have a ton of energy and play hard all of the time. They don’t jog out ground balls or fly balls, pout after an error or throw their helmet after a strikeout. It doesn’t mean these guys are happy with falling short, it just means these guys truly love the game and play it the right way! 2. They look like they’re having fun! The higher levels in baseball you go, the more “job-like” it becomes. However, how many times have you gone to a professional game and seen players sitting by themselves pouting? I never have! Whether it’s before the game, during, or after, those guys absolutely love every second of being a baseball player! They can often be seen laughing and playfully chiding each other. That said, it is crucial, of course, to understand the difference between having fun and goofing off. 3. He’s a good teammate. Going along the lines with #2, a player that has passion for the game rubs off on all of his teammates. He is not just focused on himself, but really enjoys watching other people be successful. His attitude is infectious and he is able to inspire others to follow his example. If you come to the field with the same attitude day in and day out, people usually like to be around you! Every time you walk into a practice or a game, remember that you are getting an opportunity to play a GAME that you love! If you have that approach every single day, baseball will never become a job for you! Training Complex- Our facility located in Chesterfield is unlike anywhere else any team trains, our state of the art facility allows us to train and practice for the upcoming season in a game like environment with our full indoor infield. One Thing will always be true. Players that practice in between practices and games will always have a step up on their competition. 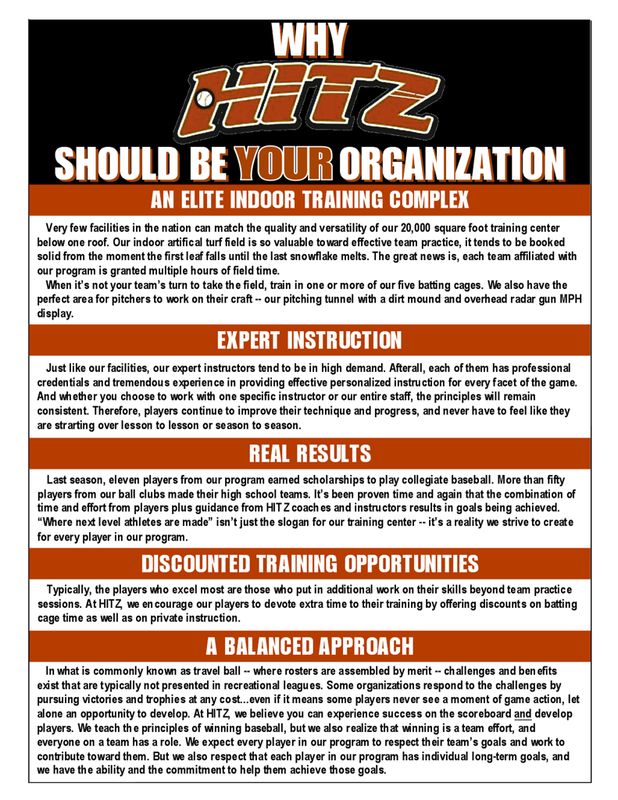 One huge benefit of playing with HITZ Baseball is that we train out of our own facility and all our players will have discounted additional access outside their team training, such as batting cage rental, private lessons, speed and agility, etc. Continuity of Instruction from Coaches and Trainers-This is one of the most important parts of a program, our Hitting instruction will be consistent message to all the players. One instructor doesn’t teach one type of hitting while the other teaches another. The same goes for our pitching instructors. This allows our athletes not to have to relearn or start over again as they progress up in age. When or If you sign up for hitting or pitching instruction, you will be with that instructor for the duration of your lessons. You won’t be passes onto one or two different instructors. Our goal is to you the tool to not only be successful at the level that you’re at, but at the next level that you aspire to get to!